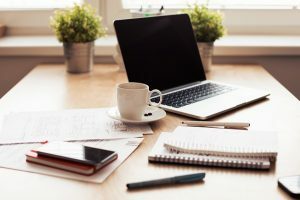 If this is your first time visiting our site, I suggest that you start with my article on How to set your goals, habits and intentions for 2019 (i.e. Steps 1, 2 and 3). 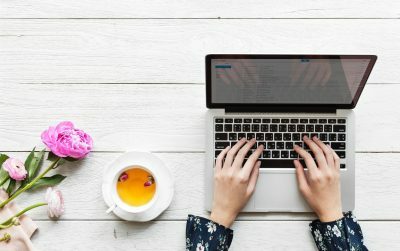 Start by setting your intentions, goals and habits for 2019 by category and then continue on with Step 4 in this article. Listing out your goals and habits for the year is not enough. You need to take further steps. This brings us to Step 4, which requires that we actively implement our goals and habits for the year. Setting regular meetings with yourself to check in and plan forward. Once you have your list of goals and habits that you want to accomplish, you have to find a way to hold yourself accountable to yourself in a way or ways that work for you. I use a couple of different methods. I know myself and know that I need multiple reminders in multiple places so that I don’t just let myself swipe left to delete the notification on my phone or close my planner. 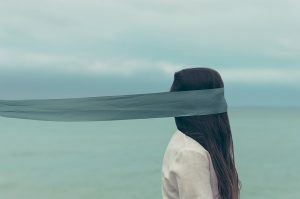 This way my goals and habits are not “out of sight and out of mind”. You might ask yourself, isn’t this redundant? Answer: Yes, but for me, having these redundancies and built in safeguards means I am more likely to accomplish the goal or complete the habit. For me, it’s totally worth spending the time on diarizing it, having reminders in a number of different places. I see results compared to when I just have 1 ongoing, ever-growing list. I love lists, and I love lists that are easy to fill in and personalized to me. The best part about lists though, is being able to cross things off the list #bestfeeling. Every Friday, I edit this Weekly Reflection document and print it off. On Sunday, I fill it out. Sometimes life happens and weeks fly by, and I don’t get a chance to fill out this document. However, when I do, I notice not only that I am holding myself accountable to my goals but I also have an emotional response. Sometimes the emotional responses are not always positive, especially when it’s been a busy week where I have had to answer “No” to many of the questions. But then, I am also able to use this emotional response to motivate myself to stick with my goals and habits the next week so that I can answer “Yes” to the questions. As you can see, it incorporates my goals and habits and makes me reflect on the week that has passed. The best part is that it takes under 5 minutes to fill out, so normally I have no excuse for why I didn’t fill it out and it’s kind of fun to fill out because it’s mostly a “Yes” or “No”. If it’s a pay day week, then I include how much money I saved that week or, in the past, how much money I was going to put towards my student loan that week. If it’s not a pay day week, then I write down how much I plan to save the next week. If I have errands to run, I type those in. I have a chore schedule, and so I list the chores that need to be done that weekend. I include who I need to call or email. For each goal and habit category, I mostly list out questions that have a Yes or No answer. e.g. Habit: I will floss my teeth at least 5 days this week. Check-in question: Did you floss at least 5 times this week? Y/N. 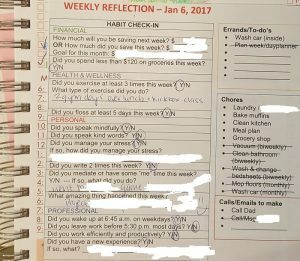 Where do you put the weekly reflection after it’s complete? In my physical planner. I tape it into the planner for the week that it applies to. This way, I have a visual reminder that I did a reflection and checked-in with myself and a record of my progress. For years I hated electronic calendars for organizing my life. I could never find one that had everything that I needed. Google Calendar doesn’t have EVERYTHING I wish it did, but it is the closest to what I want in an electronic calendar. Mostly, I use Google Calendar as my go to when I am out and about and someone asks me whether I am free on X date or whether I can go to somewhere on X date. It’s a quick and easy method of checking where I am and what I am doing rather than having to tell the person I don’t know and have to check my physical planner when I get home. The month view is visually appealing, as are the other views. The ability to colour code reminders, events and goals. e.g. anything related to money in my calendar is green and all reminders are yellow. The ability to add notifications to reminders and events e.g. 1 week, 1 month. The ability to have events reoccur in future years e.g. birthdays, anniversaries. I can enter location/map details and it connects with Google Maps. I can invite other contacts. I can add an image to the event. It links to my email account and adds in my flight information so when I get to the airport, I don’t have to go searching for the email because all the information is in my calendar. Dislike: One thing I really don’t like about electronic calendars is that your reminders or tasks can get “lost” if they are not moved over. It’s easy to forget to go back and move them forward. It’s easy to lose reminders or things you have to do because when a notification comes up, and you are really busy and you swipe left, the reminder is deleted but yet you never completed the task and you can forget about it. I am a HUGE fan of day planners because they serve as a physical and visual reminder of what the week, month and year ahead holds. I have used MANY, MANY different kinds of day planners. I have a date (a meeting) with my day planner weekly to plan my upcoming week. I also have a meeting with day planner on the weekend (usually) before the next month starts so I can plan the upcoming month. I set out what I do at my weekly meetings, monthly meetings and quarterly meetings below. Either make a calendar with all your family or travel photos or buy a calendar to hang on the wall. I recommend hanging the calendar in a place that you will see it daily. Are you getting the sense I LOVE visual reminders? Well, you’re right, I do. A physical wall calendar is another great visual reminder. I create a family calendar every year with a different theme, so I can use all of the photos we have taken and remember the travels we have had. The photo calendars make great gifts too, especially for the person in your life who has everything (e.g. grandparents). Is there anyone in your life who you could make yourself accountable to for your goals and habits? Perhaps a family member (mom, dad, sibling), significant other, friend, co-worker? If yes, it could be that you are accountable to 1 person for 1 of your goals or habits, where you text, call or tell them that you, for instance, meditated 5 times in one week. Or, you could have a gym buddy who knows the number of days in the week that you want to go to the gym. Another option could be to have another person join you in accomplishing a goal or habit. For example, rather than watching a debt show alone weekly to motivate you to pay off your debt, you could watch it with another person on a weekly basis or during Sunday night dinner. Actionable Tip: Have another person join you or know about your goals and habits to help you in accomplishing your goals and in implementing your habits for 2019. Pick as many or as few of these that you want to implement in your life. 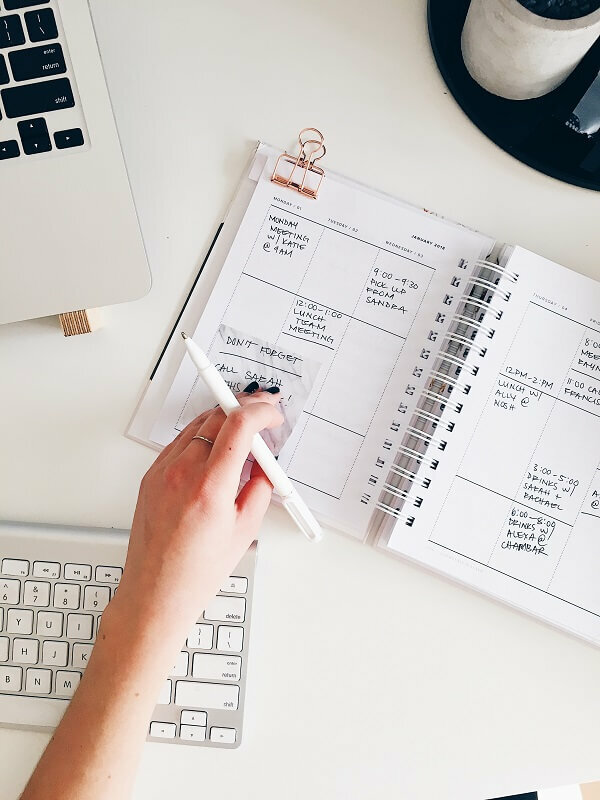 Use my electronic calendar and physical planner to plan my upcoming week and set the goals and habits that I can for that week. E.g. set my 3 exercise days, yoga day, when I will call my family and friends, etc. Once I have the week figured out, I can meal plan for the week and make the grocery list. Actionable Tip: I find that once it’s written down and written down in 1 or more places, I am more likely to do it. And, it’s not that I don’t want to call my family or message my friends, it’s just that sometimes weeks can go by and I might not notice (yes, that’s probably not healthy when that happens and yes, I probably have lost control of my life, which is what I am working on being better at), but it’s the reality of private practice law and being a lawyer. Fill out the physical wall calendar. I usually write in pay day, work travel, personal travel, volunteer events and friend or family events. 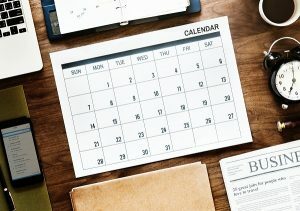 Look at what is coming up in the month and see if there are any errands or to-do items that I can schedule for a specific day that month and what reminders I need to put in my electronic calendar and physical planner. E.g. buy a birthday card, brainstorm the gift idea and buy the gift; pack for an upcoming trip; buy something for a trip; take my dry cleaning in; or book a haircut. Do my budget for the next month and complete my actual budget from the previous month. Pull out your mind map and review what your goals, habits and intentions are for 2019.
Review what you have done in the year to date, and identify what goals you have not been able to accomplish and what habits you have not been able to implement. After you have identified them, find ways to accomplish some or all of the remaining goals and implement those habits using the S.M.A.R.T approach. Review the intention(s) you set for 2019 and reflect on whether or not in the year to date you have lived with that intention in your actions, thoughts and words. If not, what can you do to live out your 2019 intention(s)? Actionable Tip: The above questions and reflections are about as much time I have to commit to a quarterly reflection. There are others who suggest more in-depth quarterly reflections e.g. listing out what went well, what isn’t going well, and lesson learned in the last quarter. By all means, if you have time to do a more thorough review, do so, but if you think you are limited for time, try to start with at least a short quarterly reflection of the above. Step 1 – Create your own mind map. Read the How to set your goals, habits and intentions for 2019 article. Step 2 – Set your intentions. Read the How to set your goals, habits and intentions for 2019 article. Step 3 – Set your goals and habits by category. Read the How to set your goals, habits and intentions for 2019 article. Step 4.2. – Set regular meetings with yourself to check in and plan forward.